Eggs have taken the food world by storm, atleast in our office canteen, my office houses atleast 12 different caterers ....our office holds about 10000 people so 12 is still a small number. One would think it is a foodie's paradise, to be part of the culinary experience...but sadly the 12 guys only try to out do each other in quantity and never on quality. They keep adding dishes to their menu boards to outsmart the other. I wish they rather focus on giving 1 great dish. Anyway, coming back to eggs, so this one guy introduced burma toast recipe. On googling I realised there was no such thing atleast what he sold as burma toast was never made in burma. I asked him, he said, burmese dont like their eggs sweet like the french (French toast reference!). I asked whether he is from Burma , he didnt look like one with chinky eyes and kid like grin that most of them carry. He ended our conversation saying, no I just heard about this...so I decided to name this spicy french toast as burmese toast. I made this innovative wrap picking some cue ....it worked very well with my kid, who normally eats bread and removes the stuffed vegetable or egg below it. 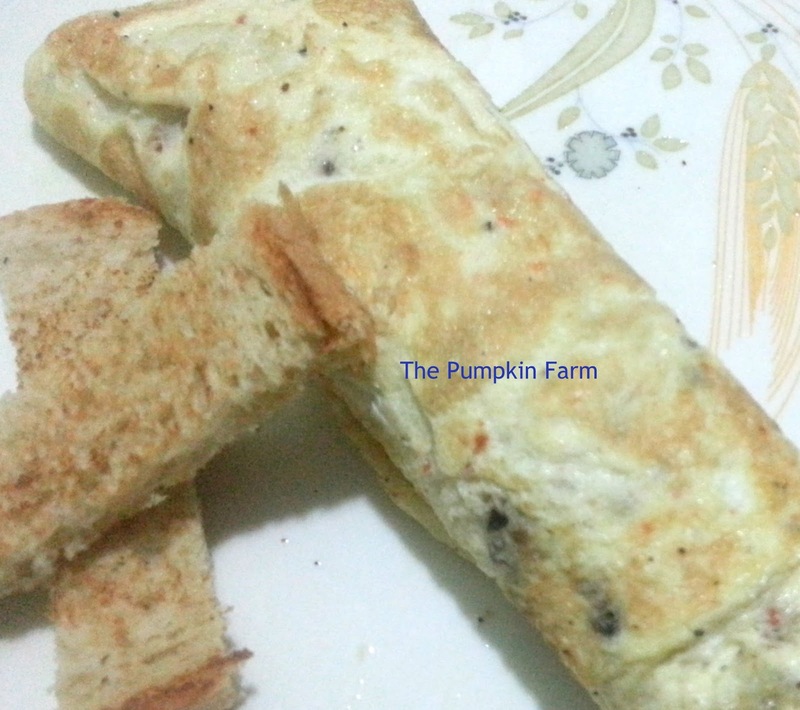 8) Place these spicy bread strips in the centre of the omellte and roll them over. Just had my breakfast and u r making me hungry again..Droolworth egg wraps. My son would love this egg roll. Simple to make and tasty. hahah, that was such a funny thing, can you imagine we have got a katti roll shop near our office and all of them are going bonkers over it. Funny part is, the roti is not with atta but parotta as we make in TN and they also have eggless rolls. Now how will that be kati roll I don't' know. However I liked what I ate. Your innovative recipe will be tried as soon as I hit my kitchen..very nice..